We are living in a tough time for musicians. Social media platforms constantly changing rules, so they are not so attractive for band's promotion and presentation as they used to be. 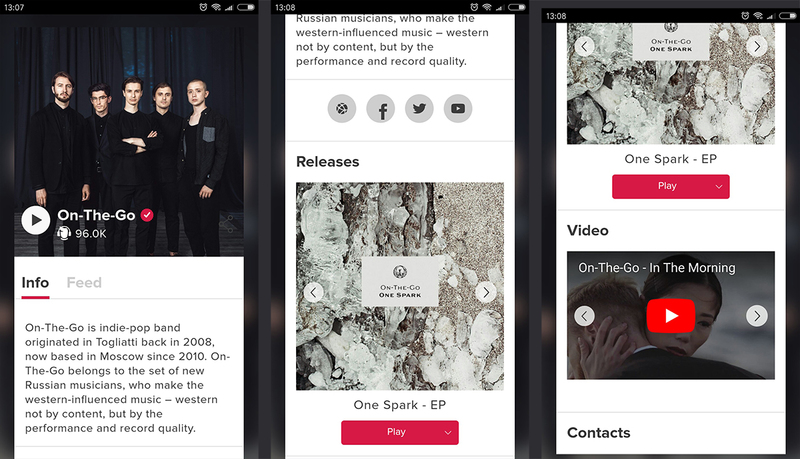 Band websites are still not so common, since it's not cheap to create one, especially with all those modern features like adaptive design for mobile devices, automatic news feed, and built-in player. This is why such service as Band.Link can be such a huge help for you. What does it do? BAND.LINK helps you to create a one page artist page with a short link, which is fully optimized for mobile devices, and icludes all information that your fans can possible need - short description of the band, photo, discography with an audio player, music videos and announced gigs. Everything in one place, with a nice customized design and a short link for sharing anywhere you need. You can send there your fans for getting your new release, or share it with booking agencies as a Press kit. If you take your music serious, Band.Link has even more thing to offer. It allows you to use a variety of marketing tools for audience behavior analytics or retargeting. You can link your page with Google Analytics or add a Facebook Pixel. You will know where your fans come from, and how they interact with your page. Besides the standard artist landing, Band.Link also can help you to create landing pages with more specific purposes. Let's take a look at all of them. Sounds good? Check out the more detailed presentation from BAND.LINK HERE, or just give it a try.